Bongmilga’s owner Kwon Hee-seung is one of a new breed of young chefs serving up Pyongyang-style naengmyeon, opening his small restaurant five years ago. Kwon’s personal love for Pyeongyang naengmyeon by Woo Lae Oak -- the oldest naengmyeon restaurant in Seoul, established in 1946 – inspired him with a mission to serve the best naengmyeon in the country. 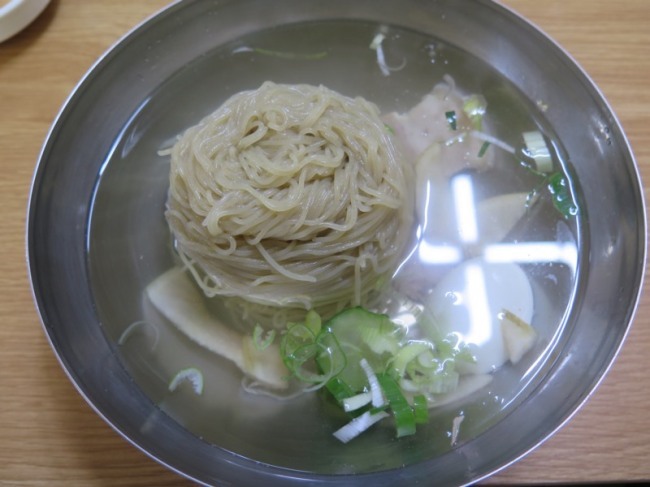 He turned his diner that specialized in makguksu -- a dish using noodles with more buckwheat content than those in traditional naengmyeong -- into Bongmilga, a 15-table naengmyeon house. Because he had deep understanding of the key ingredient, buckwheat, Kwon wanted to take on a bigger challenge: finding the greatest combination between buckwheat noodles and broth. “How much buckwheat is in the noodles is not that important,” Kwon said. In the early hours of every morning, Kwon simmers fresh broth for the day, using Korean beef, radishes, spring onions and other vegetables, and some medicinal herbs. Then he cautiously seasons the broth with salt and soy sauce aged for three years. That’s why a bowl of Pyeongyang-style naengmyeon by Kwon tastes lighter and cleaner than more common versions, despite the thickness of the noodles and their high buckwheat content. His noodles are made with 80 percent buckwheat flour and 20 percent sweet potato starch, which make them less chewy and instead smooth and easy on the tongue. Neung Ra Do, another newcomer that started in Pangyo, Gyeonggi Province, is also building up its reputation as a Pyongyang-style naengmyeon restaurant. Its second chain opened in 2015 in southern Seoul. A bowl of Neung Ra Do’s chilled naengmyeon gives off a strong scent of buckwheat and beef broth. 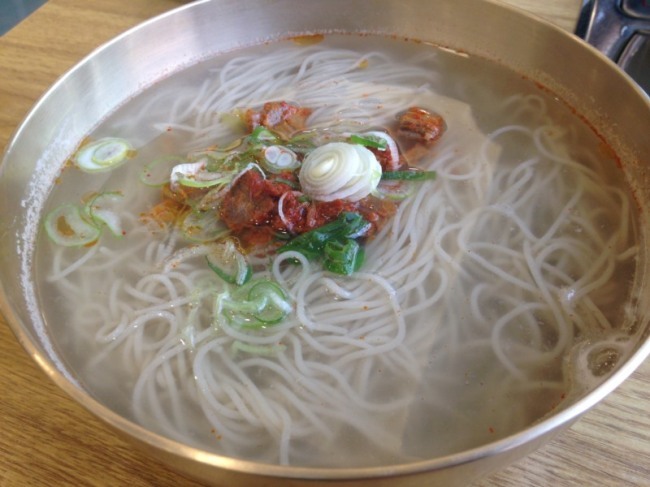 Its dedication to the quality of chilled naengmyeon is demonstrated in its choice of ingredients, using only locally produced beef and Mongolian buckwheat, the Michelin Guide inspectors noted. Slightly older than Bongmilga and Neung Ra Do, but with around two decades of experience and loyal customer bases are Jinmi Pyongyang Naengmyeon in southern Seoul and Jungin Myeonok in Yeouido. The owners of Jinmi and Jungin both inherited the recipes from their parents and run their restaurants as a family business. In the meantime, the most traditional and old school naengmyeon restaurants remain undaunted, with most located north of Seoul’s Han River. 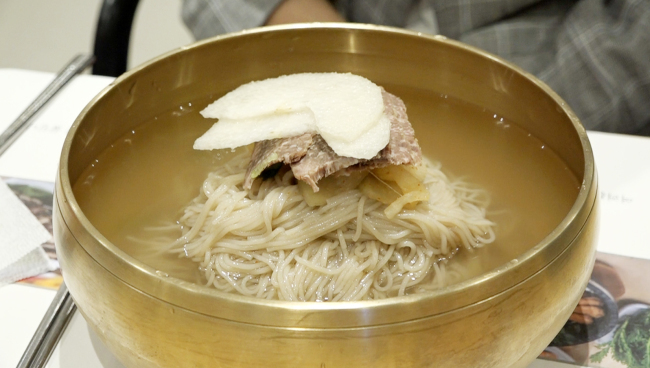 Seoul’s top five traditional naengmyeon restaurants that are running for more than 60 years are Woo Lae Oak, Eulji Myeonok, Eulmildae, Pildong Myeonok and Pyongyang Myeonok. Compared to the newcomers’ clearer and lighter broths and noodles with higher buckwheat content, the old masters serve chewier noodles with more starch and a thicker, more robust brown beef broth.